I just wanted to inform you of the great feedback that we received from Lindsey, our client who booked the drumming workshop with us. With regards to you guys, she has informed that your were really energetic, skillful and observant. Lindsey said how people were raving about the event and you did a fantastic job at bringing enthusiasm out in everybody attending. The feedback is brilliant and I wanted to take the opportunity to thank you and the musician who assisted. Thank you Rojo & Co for passing this great feedback on to us and we look forward to working with you again! Unbeatable Energy specialises in providing interactive rhythm events which inspire people in businesses and organisations. 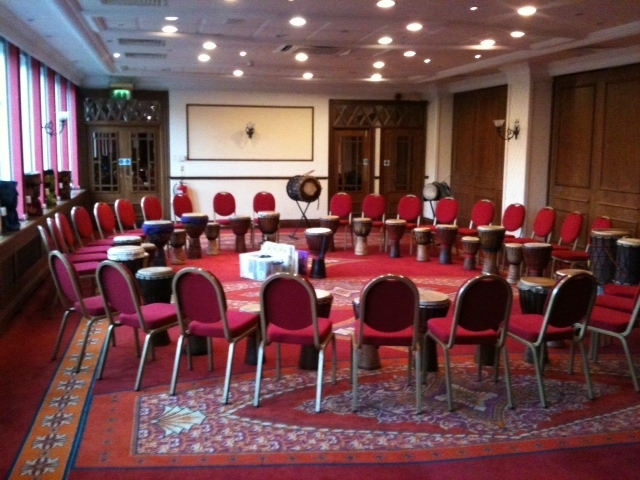 We have over 15 years of experience in facilitating corporate drumming events in both the UK and overseas to a wide range of established brands including names such as Google, Walt Disney, GSK, Moneysupermarket.com, Volvo Trucks and PepsiCo. As a result we deliver with confidence, passion and (of course) ‘energy’! Unbeatable Energy deliver outstanding drumming team building events throughout the UK which have included the following cities: London, Guildford, Bristol, Cheltenham, Birmingham, Coventry, Leicester, Nottingham, Derby, Manchester, Stockport, Crewe, Chester, Leeds, Bradford, Sheffield, Beverley, Hull, York, and Edinburgh.